Neurodynamics refers to the communication between different parts of the nervous system and to the nervous systems relationship to the musculoskeletal system. 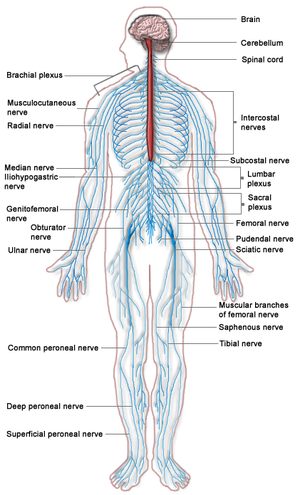 It has been shown that the nerves move independently from other tissues. The term Neurodynamics first made an appearance in 1989 and has since been further developed over the last 30 years. Neurodynamics is now seen as an important part of injury assessment and treatment. Neurodynamics in the sense implied here is the mobilisation of the nervous system as an approach to physical treatment of pain. The treatment and or assessment relies on influencing pain physiology via the mechanical treatment of neural tissues and non-neural structures surrounding the nervous system. This mobilisation activates a range of mechanical and physiological responses in nervous tissues. eg neural sliding, pressurisation, elongation, tension and changes in intraneural microcirculation, axonal transport and nervous impulse movements. To apply the principles of neurodynamics a good understanding of the neural basics, as defined below, is needed. 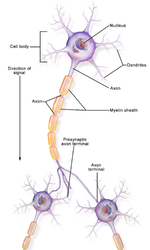 Neurophysiology - study of the function of the nervous system. Neurobiomechanics - based on the research of bioengineering researchers, neuro-surgery, orthopedic surgery and biomechanists, then utilised by neurosurgeons, orthopedic surgeons and by integrated physical medicine practitioners (eg physiotherapists, chiropractors, nurse practicioners). These practitioners focus on aiding people in the restoration of biomechanics of the skeletal system in order to measurably improve nervous system function, health, function, quality of life, reduce pain and the progression of degenerative joint and disc disease. Neuropathology- study of diseases of the nervous system. For an indepth look at neurodynamic testing look at the below resources. This presentation, created by Mark Kargela as part of the Evidence In Motion OMPT Fellowship, discusses the upper limb neurodynamics. This presentation, created by Damian Rodriguez, Allison Rose, David Self, Blake Spoon; Texas State DPT Class. 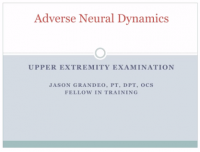 This presentation, created by Jason Grandeo, as part of the Evidence In Motion OMPT Fellowship, discusses the adverse neurodynamics in the upper quadrant. This presentation, created by Jason Grandeo, as part of the Evidence In Motion OMPT Fellowship, reviews indications for using upper-limb neurodynamic tests, describes normal sensory responses for each of the upper limb neurodynamic tests, reviews the validity of the upper limb neurodynamic tests, and describes positive findings with upper limb neurodynamic tests.